Decorating for the holidays is more than just putting up the Christmas tree. It’s garland, wreaths, stockings, centerpieces and nutcrackers. It’s colorful lights, Santa figurines, serving dishes and reindeer. With various trends, color palettes and styles, it can be challenging to figure out where to begin. 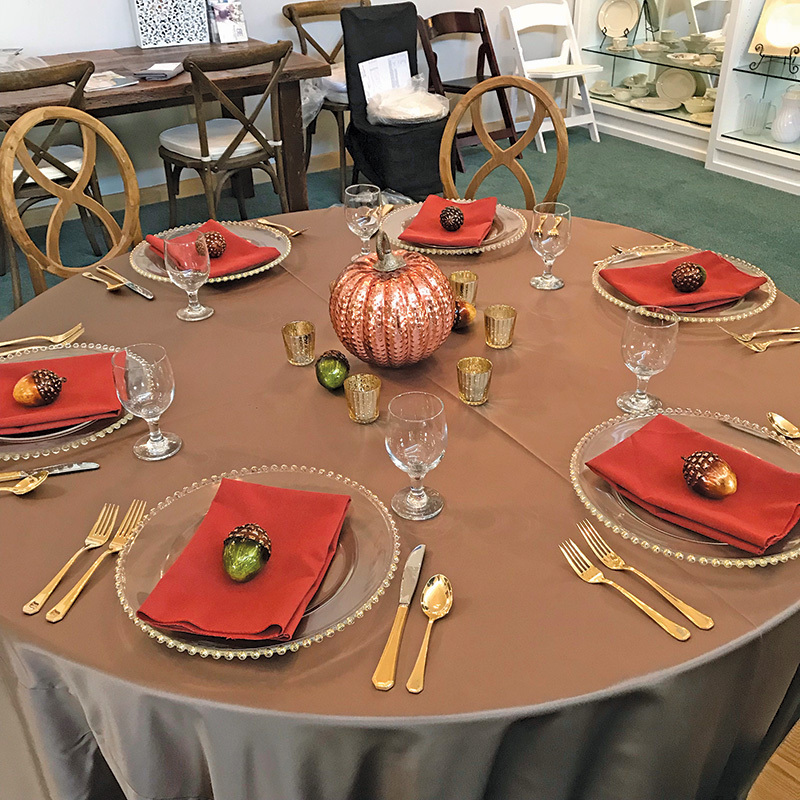 That’s why our executive editor, Kelsey Smith, discussed holiday decor tips and trends with local experts to get a head start this holiday season. Keep these ideas in mind when you deck the halls this Christmas. Q. What advice do you have for setting up a nice holiday table? A. I love to use linens, charger plates and pretty china to set a festive table for my family and friends. I like to mix some of my personal seasonal items with candles, natural elements and floral. Not many people have the storage needed to have the perfect glass for a variety of drinks. So, renting is a fun option. We have customers that rent 25 place settings every year for Thanksgiving, so they can just rinse them off and not worry about a full clean-up. At The Rental Company, we love to help with fun ideas and large or small orders. When your guests feel like you put in an effort, they feel special, pampered and honored. Q. What are some floral techniques to keep in mind for holiday decorating? A. Christmas decorating is so much about tradition. Decorate with vintage ornaments and favorite items from your past. Wooden vases and bowls are very trendy. Cluster a group of similar jars or vases on your table or windowsill. Add a stem of evergreen to each and pop in an ornament or two, and you’re done. Keep it simple, use the same kind of greens throughout the house. Use your favorite variety of fresh flowers. White and bright green are trendy, but classic. To get a more lush, updated look on a budget, add fresh greens to your old artificial wreaths and garlands. Don’t be afraid to bring in cuttings from the trees and bushes in your own yard. Q. What tips and tricks do you have for decorating the home during the holidays? A. Look at the hues and colors you already have in your home. Are they warm or cool tones? Use that as your holiday palette if you don’t know where to begin. Try and stick to one general theme and color scheme when picking out holiday pieces. If you lean toward a more elegant look, accentuate your decor with subtle sparkles, glitter, glass and pieces that will shine. For the more rustic/farmhouse look, take advantage of what Mother Nature has surrounded us with! 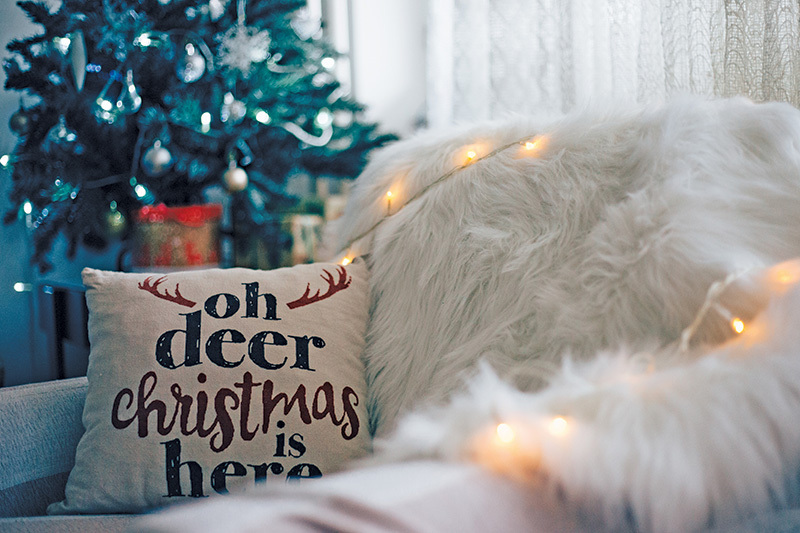 Cut some fresh pine off of branches to use around votives, incorporate pine cones in your centerpieces and use a fun holiday throw pillow to add a pop of color on your accent chair or couch.